Background: Pesticides residues in agricultural products have posed a serious threat to food safety and human health, so it is necessary to develop a rapid and accurate method to detect pesticide in the environment. N-OMC with excellent electroconductivity, high biocompatibility and the functional amino group that can be covalently attached to the enzyme can be applied to construct a sensitive and stable acetylcholinesterase biosensor for rapid and accurate detection of organophosphorus pesticides with the help of L-cysteine self-assembled monolayer and AuNPs. Methods: Transmission electron microscopy, scanning electron microscopy, Fourier transform infrared spectroscopy and nitrogen adsorption measurements are used to characterize materials. Electrochemical impedance spectroscopy and cyclic voltammetry are used to study the surface features of modified electrodes. Differential pulse voltammetric is used to measure the peak current of modified electrodes. GC-MS is applied to verify the reliability of the prepared biosensor for organophosphorus pesticides detection. Results: N-OMC was synthesized and applied to constructed stable and sensitive acetylcholinesterase biosensors. 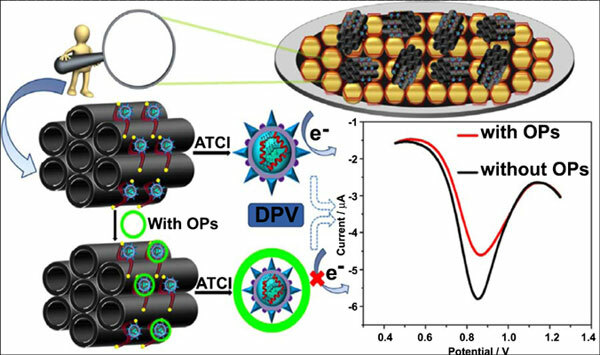 The combination of N-OMC, L-cysteine self-assembled monolayer and AuNPs to modify the electrode surface has greatly improved the conductivity of biosensor and provided a stable platform for acetylcholinesterase immobilization. The linear detection range of paraoxon was from 3 to 24 nM with a lower detection limit of 0.02 nM. Conclusion: The biosensor exhibited satisfactory reproducibility, repeatability and stability, and was successfully employed to determine the paraoxon in vegetables as well as tap water samples, providing a promising tool for rapid and sensitive detection of organophosphorus pesticides in agricultural products.